Visitors interested in the Fort Lauderdale International Boat show can purchase a “Fly & Sea” luxury boat show experience package that includes 5 VIP tickets to the boat show, a roundtrip flight from any New York City airport to FLL, a Cadillac Escalade transfer to/from airport to the hotel and boat show, a $250 voucher to Il Mulino New York restaurant and a 3-night stay at Acqualina Resort & Spa, ranked by U.S. News & Report as #1 hotel in Florida and #1 beach front hotel in the Continental U.S. by Tripadvisor. 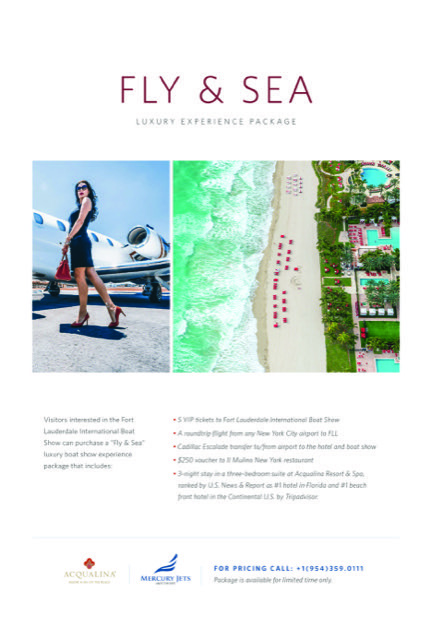 Fort Lauderdale International Airport based private jet charter company Mercury Jets has announced a luxury experience partnership with the Five Star Acqualina Resort & Spa for the 59th Fort Lauderdale International Boat Show set to take place from October 31st through November 4th, 2018. The “Fly & Sea” luxury boat show experience package will bring a new way of experiencing the largest in-water boat show in the world. Exhibits at FLIBS range from astonishing super-yachts to boat for every budget, as well as electronics, fishing gear, nautical-themes home interiors and goods. The package includes a 3-night stay in a luxury three-bedroom oceanfront suite at Acqualina Resort & Spa with a $250 voucher to dine at the famous Il Mulino New York restaurant. Guests will also receive 5 VIP tickets to the boat show, as well as transportation arranged from your private jet to the hotel and boat show. Mercury Jet’s white-glove concierge team will also arrange a roundtrip flight from any New York City airport to Fort Lauderdale International Airport (FLL) and help you select the aircraft that best suits your needs. “Many of our guests fly on private jets so this is the perfect package to elevate their experience at this year’s Fort Lauderdale International Boat Show,” said Deborah Yager Fleming, CEO & Partner at Acqualina Resort. “We are looking forward to what this enhanced experience will do for the Fort Lauderdale International Boat Show and the community at large,” said David Gitman, Executive Director of Mercury Jets. Total package rates: $38,282.00 (light jet), $44,282.00 (mid-size jet) and $54,282.00 (heavy jet). To purchase, please call 954-359-0111 (877-359-6732). Package is valid between October 31 and November 4th, 2018 and cannot be combines with any other offers. Established in 2010, Mercury Jets is a white-glove private jet service provider of the Monarch Air Group family. Mercury Jets provides on-demand private jet charters with no upfront costs or membership fees. With safety being the top priority, Mercury Jets preselects each and every aircraft for each and every flight. Their unrelenting dedication to safety, customer service and above par performance has rewarded them with extensive return business, with some clients flying with them for over a decade. As part of the Monarch Air Group family, whose operations have been established in 2006 and since has provided mission critical logistics to the U.S. and foreign governments, Fortune 500 corporations, captains of industry and leading NGO’s, Mercury Jet’s customers benefit from their top notch operations team and professional concierge service. For more information, visit https://mercuryjets.com. Acqualina Resort & Spa is a place where the charm of a Mediterranean villa meets elegance on the beach. A seaside luxury haven located on 4.5 beachfront acres in pristine Sunny Isles Beach, Acqualina Resort & Spa features 98 impeccably appointed guest rooms and suites and 188 residences with breathtaking views of the Atlantic Ocean, world-class dining including Il Mulino New York, three oceanfront swimming pools, spacious meeting rooms and an innovative marine biology-based children’s program. A variety of lavish interior and exterior venues provide an ideal background for opulent weddings and memorable events. Acqualina Spa by ESPA, the first ESPA-branded spa in the United States, provides guests with an exquisite 20,000-square-foot, two-story tranquil sanctuary of excellence and relaxation. A family owned and operated property, Acqualina is a recipient of the coveted Forbes Travel Guide Awards for both hotel and spa and the AAA Five Diamond Award. For more information, visit acqualinaresort.com.